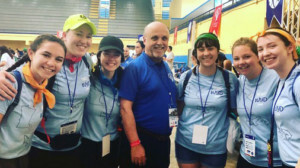 Lasallians from the District of Eastern North America (DENA), the Midwest District and the District of San Francisco New Orleans attended the 2019 World Youth Day, which took place in Panamá, January 22-27, 2019. Staff, alumni, and students from Saint Mary’s University of Minnesota (SMUMN) in Winona, Minnesota, represented the Midwest District. A highlight of their trip was meeting Superior General Brother Robert Schieler, FSC, during the International Encounter of Young Lasallians, an event which is part of the celebration of the Year of Lasallian Vocations. From the District of San Francisco New Orleans, two students, senior Francisco Gaytan and junior Rudolfo Martinez from Cathedral High School in El Paso, Texas, also attended. From DENA, Brother Michael Andrejko, FSC, and Brother Edward Shields, FSC, were in attendance.